Have you seen one of these beautiful creatures? We are not posting a Mystery Object for July but I am taking the opportunity to ask you if you have been visited by one of these beautiful butterflies. 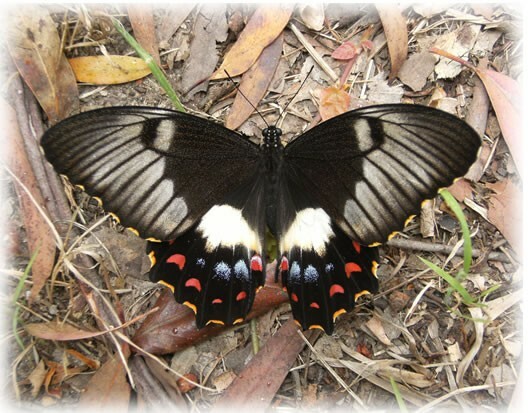 In 2008 during a high wind this butterfly took refuge amongst the leaf litter near our wheelie bins. My reward for putting out the garbage was an encounter with this welcome visitor. We had not seen one quite so beautiful in our area before nor have we seen one since. Perhaps in earlier days when there were abundant wildflowers in our valleys there were more butterflies and bees in our vicinity. Can you name this kind of butterfly? Have you seen one recently? What varieties visit your area? Do leave a comment.